Shaniwarwada is a palace fort in the city of Pune in Maharashtra, India. Built in 1746, it was the seat of the Peshwa rulers of the Maratha Empire until 1818 when the Peshwas surrendered to the British. The fort itself was largely destroyed in 1828 by an unexplained fire, but the surviving structures are now maintained as a tourist site. The Aga Khan Palace was built by Sultan Muhammed Shah Aga Khan III in Pune, India. Built in 1892, it is one of the biggest landmarks in Indian history. The palace was an act of charity by the Sultan who wanted to help the poor in the neighbouring areas of Pune, who were drastically hit by famine. Aga Khan Palace is a majestic building and is considered to be one of the greatest marvels of India. The palace is closely linked to the Indian freedom movement as it served as a prison for Mahatma Gandhi, his wife Kasturba Gandhi, his secretary Mahadev Desai and Sarojini Naidu. It is also the place where Kasturba Gandhi and Mahadev Desai died. In 2003. Mulshi is the name of a major dam on the Mula river located in the Mulshi taluka administrative division of the Pune district of Maharashtra State, India. Water from the dam is used for irrigation as well as for producing electricity at the Bhira hydroelectric power plant, operated by Tata Power Company LTD. The station operates six 25MW Pelton turbines and was established in 1927. It mostly supplies power to Mumbai. The Raja Dinkar Kelkar Museum is in Pune, Maharashtra, India. It contains the collection of Dr Dinkar G. Kelkar (1896–1990), dedicated to the memory of his only son, Raja, who died an untimely tragic death. The three-storey building houses various sculptures dating back to the 14th century. There are also ornaments made of ivory, silver and gold, musical instruments, war weapons and vessels, etc. The collection was started around 1920 and by 1960 it contained around 15,000 objects. In 1962, Dr Kelkar handed his collection to the Department of Archaeology within the Government of Maharashtra. Mahatma Phule Museum is a museum located in Pune a city in the Indian state of Maharashtra. 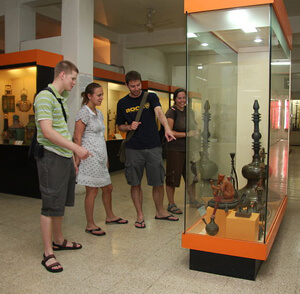 It was founded in 1875 and was then called the Poona Industrial Museum, subsequently it was named Lord Reay Museum. In 1968,it was renamed as Mahatma Phule Museum.